As you may know, because of my extremely breakout prone skin I can be a bit obsessive about checking the ingredients in the cosmetics I use. I am starting to get a bit more savvy on the whole ingredients front in general and I thought I'd share with you some of the things I've learnt (and maybe make it into a regular series of posts), starting with the order of ingredients in cosmetics and what difference this makes. Just for a bit of background information, in Europe the labelling of cosmetics is covered by the EU/EC Regulation No 1223/2009 and is enforced in the U.K. by Trading Standards under the Cosmetic Product Enforcement Regulations 2013. Countries outside of the EU have their own laws, for example the U.S.A has the Federal Food, Drug and Cosmetic Act 1938 and the Fair Packaging and Labelling Act, which is enforced by the FDA. 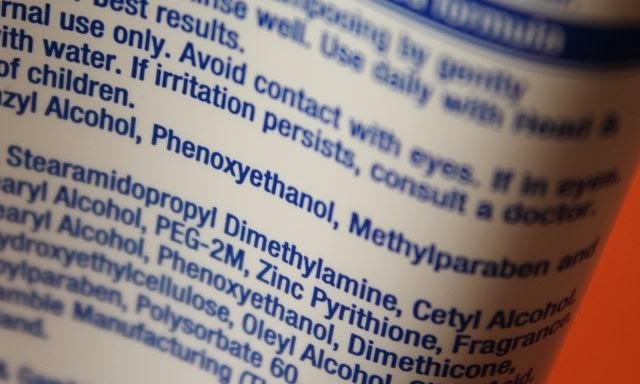 The law states that cosmetic products must be clearly labelled with the ingredients, whether this is on the actual product itself or on the packaging. (There are however special exceptions for extremely small products that are difficult to label.) The list must begin with the word "ingredients" and this list must be in descending order of the weight of the ingredients. This order is one of the things I take into account when looking for new skincare products or makeup (mainly base products). Basically, the very first ingredient is what the product contains the most of. The further you go down the list, the less concentrated the ingredients are. The only exception to the descending order rule is that ingredients with concentrations of under 1% can be listed in any order. The manufacturers do not have to state the percentage breakdowns by law, so it is hard to know exactly how much of each ingredient is in the product. If there is an ingredient I'm looking to avoid, my personal rule is that I don't use the product if the specific ingredient is in the first half of the list. If it is in the second half of the list, it is my view that it shouldn't be concentrated enough to affect my skin. I remember reading an interesting ingredients post from Sarah over at Sugarpuffish about a product from The Body Shop, I think it was the Chamomile Cleanser. The ingredient chamomile was the very last ingredient on the list, which means you aren't really going to see much - if any - benefit from the product containing chamomile. Unfortunately I think as long as the product name itself isn't completely deceptive there aren't really any rules on this, so it's something to look out for, especially if you want the benefits of specific ingredients. I really hope you find this post useful and please do let me know if you would like to see more like this! Do you take note of the ingredients in the beauty products you buy? I always take a look at the ingredients. There are some ingredients I don't want in my products, for example Paraffinum Liquidum.